Somehow people like to get scared in different way, such as watching horror movie and speeding. Now there is a new way of “enjoying” adrenaline rush caused by great height, fast velocity and strong G-force. 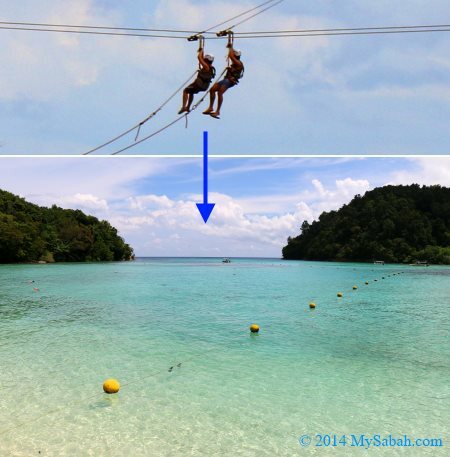 The 235-Meter-long (771 feet) zipline (a.k.a. 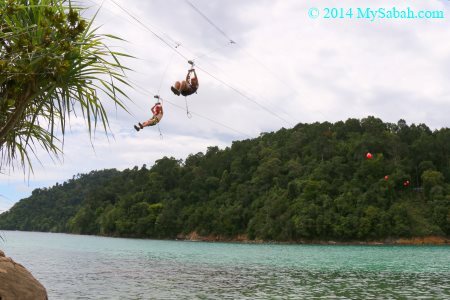 Flying Fox), between Sapi and Gaya Islands nearby Kota Kinabalu city, is now open for thrill seekers who want to fly across the sea at a speed of 55 KM/Hour (34 Mile/Hour). 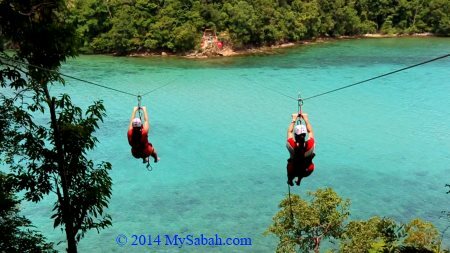 Known as Coral Flyer, this world’s longest island to island zipline is opened in early May and managed by Ropeskills. 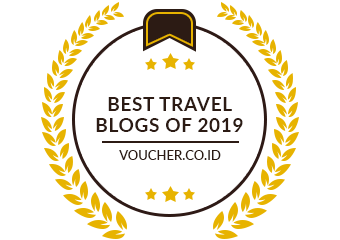 I was lucky to be one of the invited bloggers to try it out. 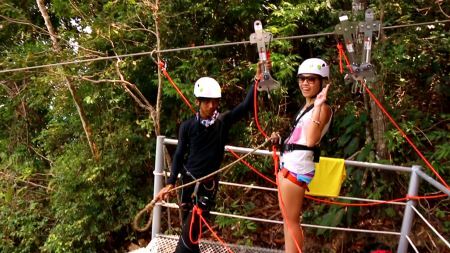 Being the longest zipline has two advantages, guest can experience the zipline for longer time at faster speed. 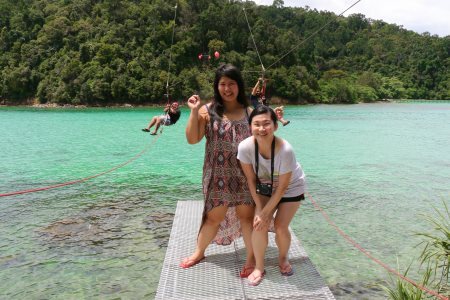 At first, we were transferred to Padang Point of Gaya Island, where the starting point of zipline located. 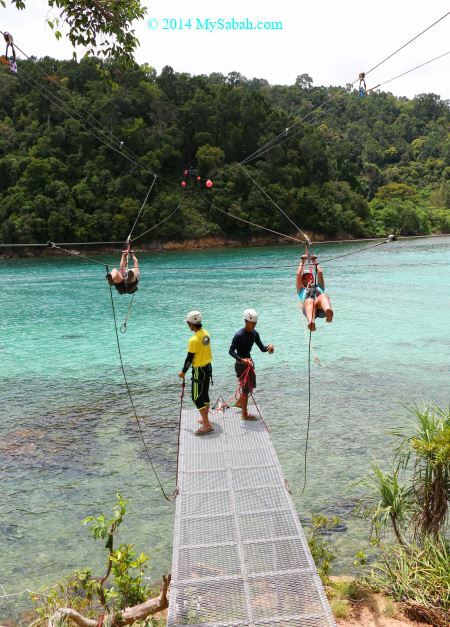 They provide free transfer (from Sapi to Gaya Island) if you sign-up for ziplining. 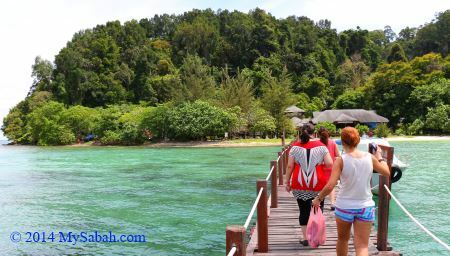 The ticket counter is at the reception desk (entrance) of Sapi Island. Pic: a signage in Padang Point, Gaya Island. 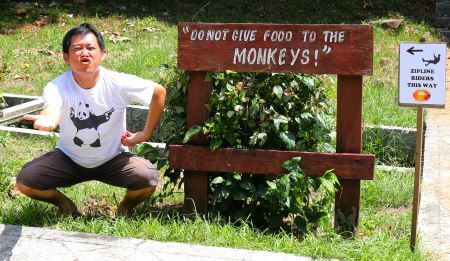 Don’t feed the monkey. At the harness station, the staffs gave us briefing and helped to put on our helmet and harness. 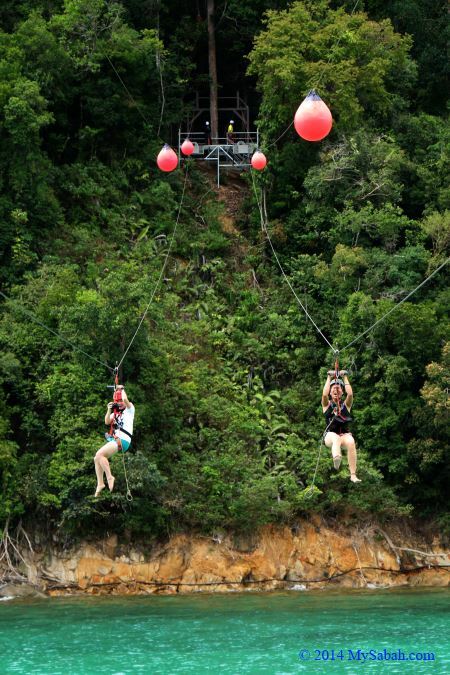 The maximum weight to zipline is 120 Kg (265 lbs), and the minimum is 40 Kg (88 lbs). There is no age limit. If the child is too small, the staff or parent can bring him/her on tandem rig for a ride. FYI, the heavier you are, the faster your ziplining speed. Pic (from left): me, Margaret, Mas and Sherrie. We are so excited. 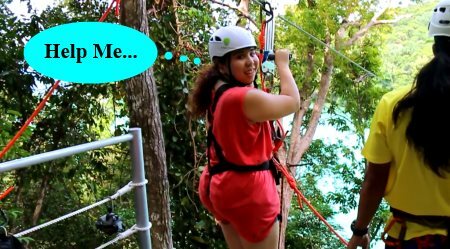 You can wear anything in ziplining. For shoes, wearing sandal is better than slipper, because you need to trek uphill a bit, and sandal won’t fall off during ziplining. Then we trekked a few minutes to the platform on higher point for take-off. There were quite a lot of tourists wanted to try zipline. This activity is getting very popular. Our hearts started to race when we realized that the zipline was not only long, but also high, it’s 45 Meters (148 feet) above the ground. Then everyone became so courteous. “You go first”, “No, you go first”, “You first”… LOL To be honest, I was nervous. Pic: sorry Sherrie, it’s too late to change your mind. Margaret and Sherrie were the first group to take off. 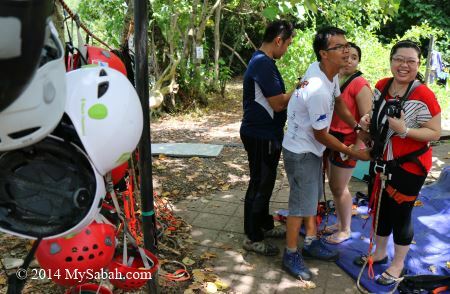 After the qualified staffs attached their harness and zipline trolley to zipline securely, they communicated with another side with walkie-talkie for clearance. Then both of them were positioned at the take off point. Once everything is set, they will push you away without giving you much time to think, haha. I bet other end could hear them both screaming all the way. 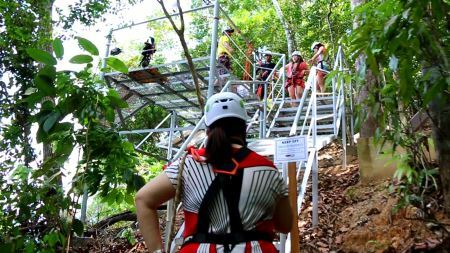 Coral Flyer adheres to the guidelines set down by the Association for Challenge Course Technology (ACCT). They take safety seriously so we are in good hands. Everything is also insured and licensed. At last it was the turn of Mas and me. There are two ziplines side by side, so we can zipline together. The moment my feet were off the ground, the feeling was like gliding and falling. The view of island and sea channel from above was beautiful. Then it got faster and faster, my heartbeat was also accelerating. Even though I knew I was safe, my body perceived that I was in danger and gave me an adrenaline rush. The ziplining lasted only 40 seconds, but I lost the sense of time and it felt like an incredibly long ride. By the time I stopped at the braking point, the strong G-force made me felt like being thrown out of a fast-moving car. It was indeed an intense fun experience. 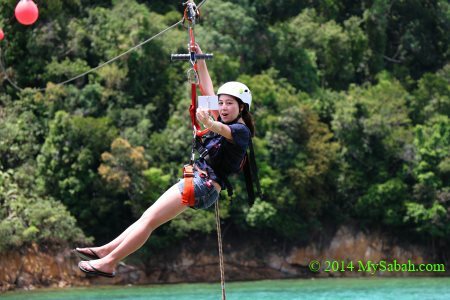 The zipline consists of two state-of-the-art ZipStop braking units imported from USA. They also have backup brake as a precaution, so there is no chance for any crash landing. The structure of Coral Flyer is made of stainless steel high-strength cables that can hold 12 tons (26,000 lbs) of weight. The harness and attachment have a strength of 2.2 tons (4,850 lbs) at the weakest point, so it can even zipline a horse across the sea without problem. The construction and operation cost of Coral Flyer is about half a million! 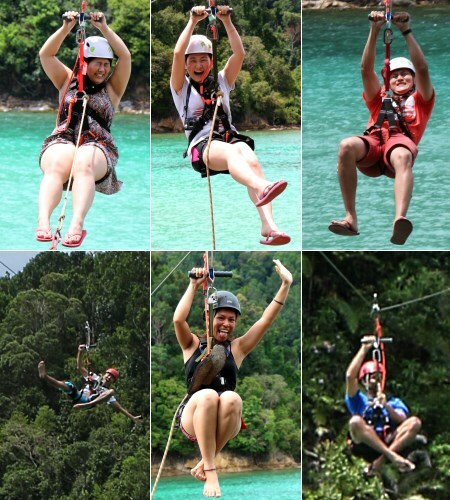 Pic: interesting poses and reaction on zipline. These bloggers really know how to act. 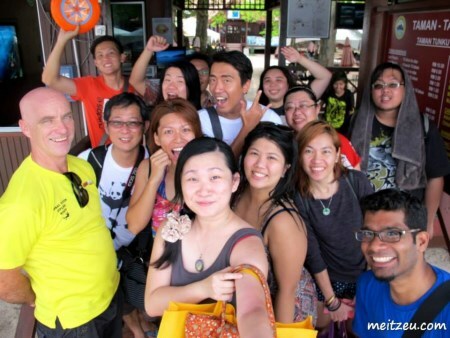 From left to right, top to bottom: Charlotte, Mei Tzeu, Hayden, Derrick, Beverly and Faisal. 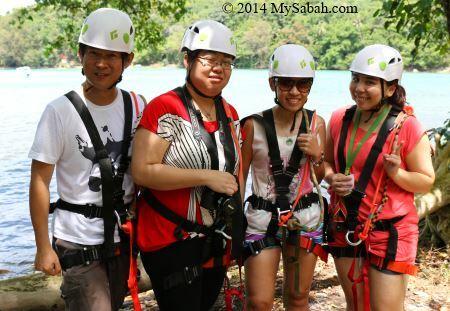 You can take picture and video on zipline (the safety of your camera is on your own risk). With only one hand holding the handle of trolley (another one holding camera), it is a bit hard to balance and your body would spin to side. Hold your camera to the side so it won’t hit the cable while braking. 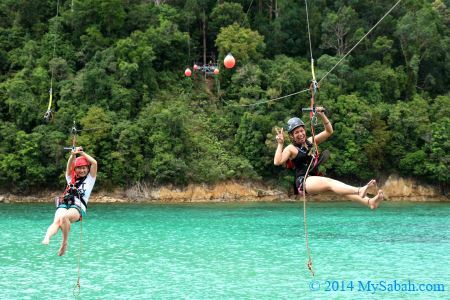 If you love hiking, you can do jungle trekking from Gaya Island Base Camp to Padang Point, then ziplining to Sapi Island. 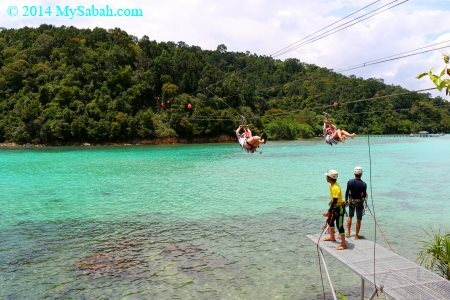 You also can buy the zipline ticket at Padang Point. 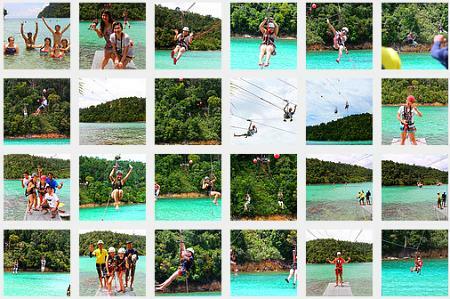 Below are some photos to prove that everyone were alive after the ziplining. No… I meant how happy they are. 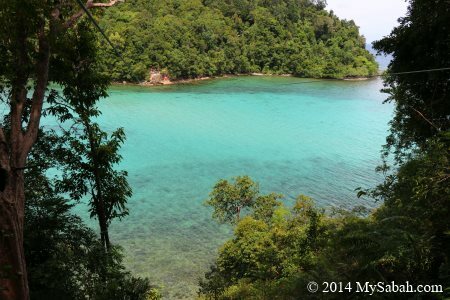 After landing on Sapi, you only need to walk a few minutes to the beach for more fun activity. Pic (Photo by Mei Tzeu): a group photo with Simon from Ropeskills (at the left) and bloggers. Thank you Simon and Dinoza for inviting us and Beverly for organizing the trip. I’m also happy to make some new friends. 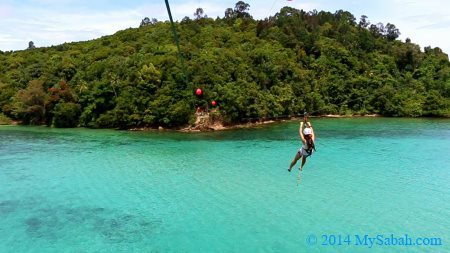 The ticket fee for ziplining is RM64 (≈USD19.70, rate as of May 2016 (6% GST tax included), fee not including island entrance fee and boat transfer from/to Kota Kinabalu). 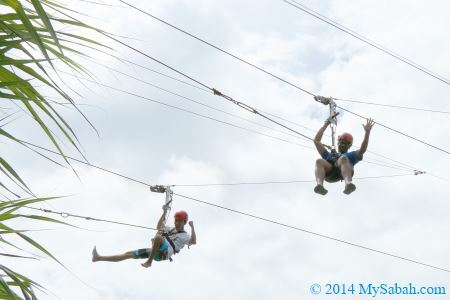 The zipline is open from 10am to 4pm daily. Walk-in visitor is welcome. You may visit the website or Facebook of Coral Flyer for more info and photos.